The RECOPAK Semi Automatic Case Over Product Packer (Semi Auto C.O.P) range, offers a number of different packing options for all types of products. Overall productivity is increased while labour costs are minimised, as only one operator is required for most applications. Case Over Product Packers provide maximum flexibility at an economical price. The RECOPAK case over packers will automatically collate product into a desired configuration. An operator simply squares an RSC case and slides it over the collated product. 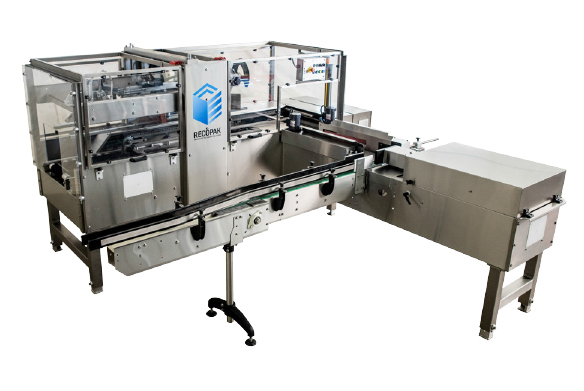 The automatic transfer system presents the loaded case to the top and bottom closing module for hot melt or tape sealing. The Semi Automatic Case Over Product Packer handles the biggest range of PRODUCTS in the market today and it is the most flexible and suitable machine for the clients packaging needs. Packaging – TUBS – BOTTLES – PACKETS – JARS – CARTONS to name a few…..
CLICK EACH DESCRIPTION ABOVE TO VIEW VIDEOS. Infeed belt and gate assembly incorporated inside the machine. Fully interlocked light curtain and polycarbonate gull wing guarding. Flight bar drive system protected by electronic torque limited control. Model OPPS is supplied standard with a Nordson model ProBlue hot melt system. Model OPPT interfaces with most common brands of case taping machines. Complete Stainless Steel fabrication available.